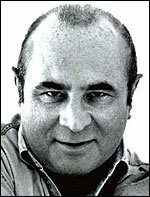 A short and stocky character star whose physical attributes have not been a barrier to his considerable success in films, Bob Hoskins first appeared on screen in 1972. By the late 1970s he had achieved a starring role in Dennis Potter 's TV series Pennies from Heaven (BBC, 1978), and his portrayal of Harold Shand in the cult crime film, The Long Good Friday (d. John Mackenzie, 1979), had already demonstrated the malleability of his talent. Despite his strong Cockney accent, he spent the 1980s playing anything from New York gangster Owney Madden in The Cotton Club (US, d. Francis Coppola, 1984), to George, the hard man with a soft centre in Mona Lisa (d. Neil Jordan, 1986), or the object of Maggie Smith 's tragic affection in The Lonely Passion of Judith Hearne (d. Jack Clayton, 1987). Though also in international box-office hits like Who Framed Roger Rabbit (US, d. Robert Zemeckis, 1988), and Hook (US, d. Steven Spielberg, 1991), Hoskins often works in low-budget local films like TwentyFourSeven (d. Shane Meadows, 1997), in which he shines as the inspirational Alan Darcy. Whether playing a serial killer (in Felicia's Journey (UK/Canada, d. Atom Egoyan, 1999)) or a famous politician (uncannily like Khrushchev in Enemy at the Gates (UK/Germany/US/Ireland, d. Jean-Jacques Annaud, 2001)), he is a compelling film presence.